Novell Data Synchronizer: Allows personal information management (PIM) data such as email, appointments, tasks, and contacts to synchronize between enterprise email and collaboration applications such as Novell GroupWise and other collaboration applications. It is a bi-directional and many-to-many synchronization solution that can connect multiple collaboration applications and mobile devices, providing real-time, event-driven synchronization. The Data Synchronizer Mobility Pack: Allows PIM data to synchronize specifically between GroupWise and mobile devices. The Data Synchronizer Mobility Pack installs a Synchronizer system, the GroupWise Connector, and the Mobility Connector. This configuration is the next generation of mobile device support for GroupWise users. Many popular mobile device operating systems are supported, including Android, Apple, Maemo, Palm, Symbian, and Windows Mobile. For information about other connectors, visit the Data Synchronizer Connector Marketplace. A Synchronizer system consists of several components that are installed together on one server when you install the Data Synchronizer Mobility Pack. The Synchronizer Sync Engine (datasync-syncengine) is a service that provides the hub of data flow between one or more pairs of application-specific connectors. The Sync Engine provides the common ground among various applications, so that data provided to the Sync Engine from one application through its connector can be passed to one or more different applications through their connectors. The Synchronizer Web Administration service (datasync-webadmin) provides a Web-based interface called Synchronizer Web Admin for administration and management of your Synchronizer system. Synchronizer Web Admin allows you to add and remove connectors, as well add or remove users for specific connectors and configure their individual synchronization settings. Users can log in to the Synchronizer Web Admin URL using their personal network login credentials to access the Data Synchronizer User Options page. Here, they can configure and control the synchronization settings for their applications. For more information, see the Quick Start for each connector. The Synchronizer Config Engine (datasync-configengine) is a service that provides communication between Synchronizer Web Admin and the Sync Engine. The Config Engine passes configuration information from the Sync Engine to Synchronizer Web Admin for viewing, and it passes your configuration changes back to the Sync Engine for implementation. The Synchronizer Connector Manager (datasync-connectors) is a service that provides communication between the Sync Engine and connectors. Synchronizer Connectors transfer data between two or more applications. Each connector acts as a code converter and data filter to translate information between an application-specific format and an application-neutral format that can be consumed by other application-specific connectors. For example, when you install the Mobility Pack, which includes the GroupWise Connector and the Mobility Connector, GroupWise content can be synchronized to any mobile device that uses Microsoft ActiveSync. Not all connectors support all of the same types of items. Initially, existing items are synchronized between applications. Which items are initially synchronized varies from connector to connector. Some connectors allow you to select which events you want to synchronize. With other connectors, you cannot customize which events are synchronized. Events and the item data associated with them flows through your Synchronizer system in the form of XML files that are processed by the connectors and the Sync Engine in order to transfer data from one application to another. You do not need this conceptual understanding of connector functionality unless you need to troubleshoot a disruption to synchronization between two applications. The Synchronizer server must be able to communicate with other servers on your network, as well as mobile devices outside your firewall. The Synchronizer server can have one instance of each connector. IMPORTANT:Multiple instances of the same connector cannot be created on a single Synchronizer server. The Synchronizer server must be able to communicate with an LDAP server on your network during installation. After installation, you can continue to use LDAP authentication for mobile device users, or you can configure the Mobility Connector to use GroupWise passwords instead of LDAP passwords when mobile devices authenticate to the system. 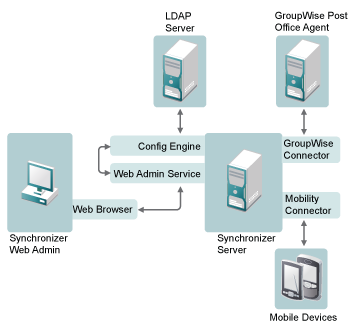 LDAP authentication is always required for access to Synchronizer Web Admin and for managing users on connectors. If you need the Synchronizer server to communicate with multiple LDAP servers, additional setup is required, as described in LDAP Proxy Server to Multiple Sources. The Synchronizer server must be able to communicate with one GroupWise POA during installation. That POA, as well as additional POAs where mobile device users’ mailboxes are located, must be configured to support SOAP communication. The initial POA uses the native GroupWise redirection process to inform the GroupWise Connector how to communicate with the additional POAs throughout your Synchronizer system. Thereafter, the GroupWise Connector communicates directly with each POA where mobile device users’ mailboxes are located. IMPORTANT:A Synchronizer system can be configured to communicate with one, and only one, GroupWise system. A Synchronizer system with a single Synchronizer server can meet the synchronization needs of approximately 500 mobile device users, depending on the amount of synchronization traffic generated by those users. If it is common for users to be active on multiple mobile devices per user, consider the number of devices in use, rather than the number of users. NOTE:Sizing recommendations vary depending on the specific connectors that are participating in the Synchronizer system. For example, the guideline of 500 users/devices pertains specifically to a Synchronizer system created by installing the Mobility Pack. This guideline meets the needs of mobile device users. Other connector combinations might support different numbers of users. Number of Users: You need to support synchronization for more than 500 users/devices. Location of Users: You need to support users that are located in distant geographical locations where synchronization performance could be adversely affected by the network connections between users and the applications that they want to synchronize data with. Location of Synchronized Applications: Applications for which data is being synchronized have meaningful organizational segments (for example, GroupWise domains and post offices). 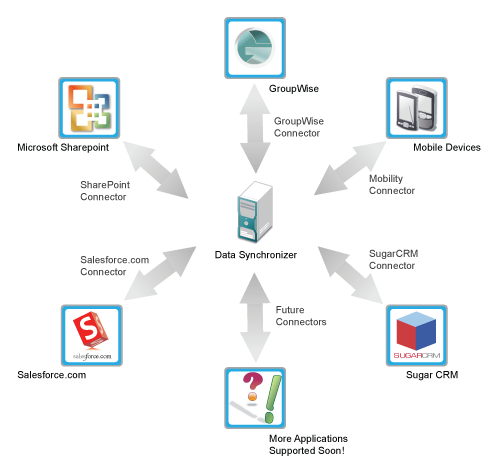 Having a Synchronizer server associated with each organizational segment helps balance the synchronization load across all users of the application. Quality of Service: Certain segments of your user population, such as executives of your organization, might expect and require a higher level of synchronization performance than typical users. This higher quality of service can be accomplished by setting up a small Synchronizer system specifically for such high-profile users. Connector-specific considerations for implementing a multi-server Synchronizer system are covered in each connector’s Installation and Configuration Guide.